Passive and active rainwater harvesting systems can reduce use of potable water for outdoor irrigation in new and existing development. Passive rainwater harvesting involves directing rainwater to the landscape using pipes, channels, berms, and basins, while an active approach involves collection of rainwater from a catchment area, such as a roof, and storage in barrels or cisterns/tanks. Basic rainwater harvesting systems are relatively easily installed. Rainwater harvesting can be incentivized via a rebate program for existing homes and can be required in new construction through ordinance or development standards. A rain barrel set up to capture rainwater runoff from the roof, store the water, and use it for landscape irrigation. Photo credit: US EPA. A growing number of communities in the Southwest have enacted rainwater harvesting ordinances. Santa Fe, County New Mexico requires that new homes larger than 2,500 square feet include a rainwater harvesting system and a cistern/pump system with a goal of capturing runoff from at least 85% of the roof area. The Flagstaff Rainwater Harvesting Ordinance (Ordinance 2012-03) requires passive rainwater harvesting techniques for new single family residential houses in order to keep water onsite, and active systems for other developments. Commercial rainwater capture systems, because of the relatively large size of the catchment area, can capture large volumes of water for on-site irrigation. Using this non-potable water supply for a non-potable use such as plant irrigation, saves higher quality, treated water for drinking, which in turn saves treatment costs for utilities. Harvesting rainwater also reduces storm runoff by retaining and infiltrating water on site. 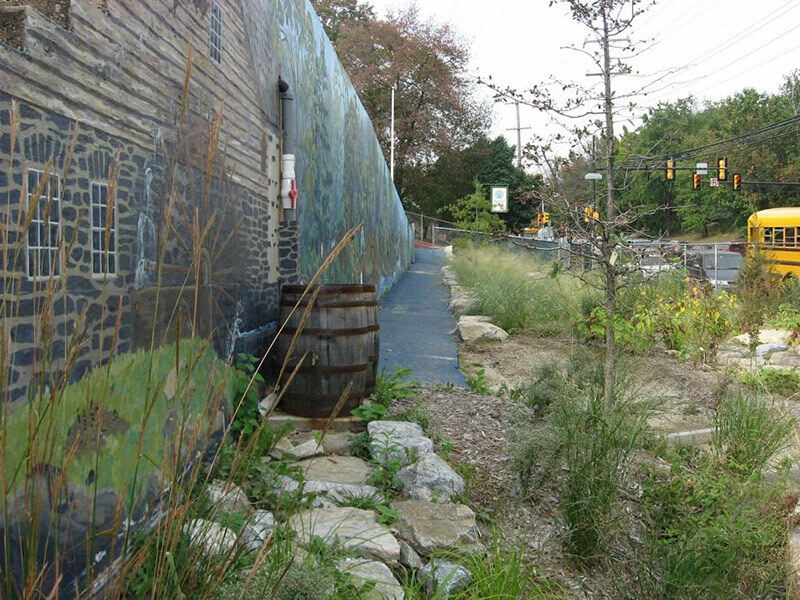 This reduces the volume of pollutant runoff to streams from the urban environment. A number of communities in Arizona, New Mexico, Texas and California offer rainwater harvesting incentives, including rebates or vouchers, for the purchase and installation of systems that typically focus on the gallons of water that can be stored in a tank. Tucson Arizona is unique in that it offers rebates for both passive and active rainwater harvesting systems. In 2008, the City of Tucson adopted the Tucson Rainwater Collection and Distribution Requirements (Ordinance 10597), the first of its kind in the nation. Development of the ordinance was spurred by an interest in water harvesting as one mechanism to address the water demand of increasing growth and the need to acquire more costly long-term water supplies. Tucson was also motivated by its long-term leadership and innovation in conservation, resource management, technology, policy and regulation, as well as wanting to create sustainable, cost-effective policies for new development. The ordinance requires all commercial development and site plans to submit a rainwater harvesting plan with a landscape water budget that shows how 50% of the estimated yearly landscape water budget will be provided by a rainwater harvesting system. This requires early collaboration between the project civil engineer and landscape architect to ensure the grading plan captures sufficient rainwater for the landscape areas. Compliance is determined based on site inspections after site grading and prior to issuance of a certificate of occupancy. Failure to meet the rainwater harvesting requirement is considered water wastage subject to monetary fines. The ordinance also prohibits use of private covenants, conditions, and restrictions that prohibit rainwater harvesting. The ordinance resulted from a stakeholder group convened by the City and composed of builders, developers, environmental groups, and others, which worked to develop an acceptable proposal. The group agreed to the 50% requirement due to concerns by the local homebuilders association that a higher percentage would require the installation of more expensive cistern systems. As a result, passive rainwater harvesting systems are being used to meet the requirements. Even with the compromise, the Tucson Metropolitan Chamber of Commerce publicly opposed the ordinance as potentially driving development outside the city limits. This has not been proven, and at least one major redevelopment project chose to voluntarily incorporate the ordinance prior to adoption, demonstrating that some businesses are interested in building in a way that considers community values. Tucson Commercial Rainwater Harvesting Ordinance 10597 is found within the City of Tucson Code, Chapter 6, Building, Electricity, Plumbing and Mechanical Code and Development Standard No. 10-03.0. The Compendium of Rainwater Harvesting Resources can be found here.